This entry was posted on September 15th, 2009 by IPSL. UPVC material is highly chemical resistant, can be cut easily cut to size, and may be heat formed (thermoformed) into and around corners. Where thermoforming is not suitable then trims are available for internal and external corners. Its semi-rigid properties allow Proclad to be installed over almost all substrates. All joint, corner, and edge trims are uPVC extrusions. 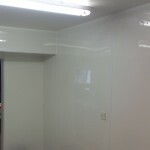 Proclad panels can be fixed to most clean and dry internal surfaces. However, they should not be installed near hot areas or where excess heat or exposed flame could damage or distort the panels. Stainless Steel should be used where temperatures exceed 60°c.